The approved project calls for a 14-story residential building containing 250 shared suites and micro-studios. Developed by National Development and co-living and micro-housing specialist Ollie, 7INK by Ollie would be Boston’s first major co-living development, emphasizing communal living. The building would provide a full range of services, unique community engagements and extraordinary shared amenity spaces. Residents at 7INK by Ollie would be provided with a regular calendar of curated social activities, Wi-Fi, cable TV and access to all Ollie communal living locations nationwide. Each housing unit at 7INK by Ollie would be furnished with transforming furniture and receive complimentary weekly cleaning with fresh linens and towels and replenishment of bath amenities. 7INK by Ollie would be located at National Development’s six-acre Ink Block neighborhood in Boston’s South End, home to a mixed-use of uses including apartments, condominiums, a hotel, one of the country’s highest volume Whole Foods Markets, acclaimed restaurants, retailers, and fitness studios. The proposed project change calls to modify the Project’s unit mix in response to assessment of market information both from the Boston market and obtained from operating co- living communities in other locations. Increased market demand from the targeted demographic of 25-40 year olds has been experienced for the multi-bedroom units due to the lower price point associated with these unit types. The overall increase in the approved total number of bedrooms from 327 to 353 is 8%. The overall building area, building height and the building envelope/footprint, as approved by the BPDA Board on July 12, 2018, will remain the same. The change to the bedroom count is achieved solely by redesign of the floor plans of the previously approved units. The 217 Albany Street project is located in the South End bordering Chinatown. The majority of the project site currently consists of service area parking and driveway associated with Ink Block residential buildings and the existing Ink Block Whole Foods grocery store, as well as a vacant two-story brick building formerly occupied by the Transit Insurance Agency. The project will construct a new all-inclusive, co-living, 14-story residential building. This will include apartments with efficient layouts, making use of reduced square footage as compared to conventional studio apartments. This is accomplished through a hotel-style residential amenities program that includes a common kitchen and lounge, co-working and meeting space, as well as fitness facilities, shared rooftop space, and housekeeping services. The building will contain up to 250 units containing 327 individually leased bedrooms, within 197 studios known as “microunits”, 35 two-bedroom units, 12 three-bedroom units, and six four-bedroom units. Each unit has its own private kitchen, bathroom and living areas. The proposed residential units will be “move-in ready” with furniture, premium Wi-Fi, and television connections. Another unique aspect of this residential concept is the inclusion of a live-in community manager to organize regular social events for residents in the building. The project will not include any on-site parking, instead, residents will be encouraged to utilize nearby MBTA train and bus service, taxis, and private ride services. Car sharing services such as Zipcar are also available in the immediate vicinity of the project site. Short- and long-term monthly public parking for residents will be available at the 175-space “Underground at Ink Block” parking facility across Albany Street under I-93. Secure bicycle storage will also be provided within the project building for residents and any building support staff. 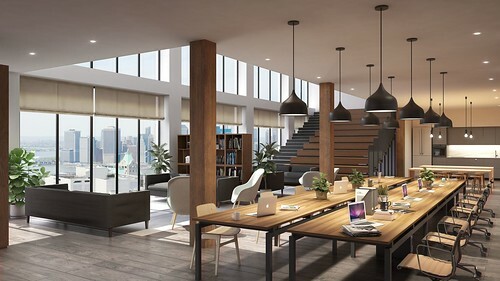 National Development has partnered with Ollie, a leading co-living and micro-housing specialist, to construct 7INK by Ollie, Boston’s first major co-living development, at Ink Block in the South End. The 14-story 7INK by Ollie would be located at the corner of Herald and Albany Streets and contain 245 shared suites and micro-studios emphasizing communal living. The proponents have filed a Letter of Intent (LOI) with the Boston Planning & Development Agency (BPDA) formally proposing the project, which would be the six-acre Ink Block development’s seventh and final building. Ink Block currently consists of apartments, condominiums, a hotel, one of the country’s highest volume Whole Foods Markets, acclaimed restaurants, retailers and fitness studios. “7INK by Ollie and the co-living program is the logical evolution of our innovative Ink Block brand,” said Ted Tye, Managing Partner of National Development, in a prepared statement. “The built-in infrastructure of Whole Foods Market, our restaurant and fitness retailers, the soon to open AC Hotel by Marriott, and our new Underground at Ink Block art park make this a perfect location for co-living.” National Development and Ollie anticipate starting construction of 7INK by Ollie in late 2018, pending city approval.